Up to 100 firefighters have been tackling a major blaze that ravaged the famous markets area in Camden Town, north London. 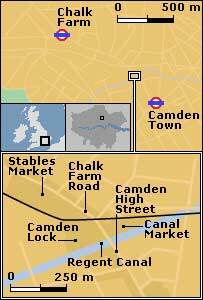 The fire was reportedly centred on Camden Canal Market, to the east of Chalk Farm Road. Police closed off several roads and the Hawley Arms pub, near the source of the fire, suffered severe damage. London Fire Brigade has said the blaze is being brought under control and there are no reports of casualties. 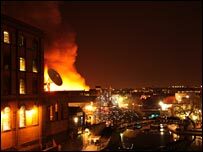 LFB station manager Guy Foster said the fire was centred around Camden Canal Market, where a number of market stalls had caught fire. He said the train line between Camden Road and Kentish Town West had been shut down. Residents have also been evacuated from some houses and flats. Firefighters were alerted at about 7.20pm on Saturday to the blaze which has reportedly consumed part of the Hawley Arms, a popular Camden pub which is frequented by celebrities including singer Amy Winehouse. There were unconfirmed reports that some people were trapped, but London Fire Brigade spokesman Nick Comery said he had heard nothing to support that. He told BBC News 24: "It's an ongoing job and we are doing our best to bring it under control and to stop it spreading. "It involves currently some market storage properties, shops and dwellings. "It is a large area that is involved. It is a severe fire, there is a lot of smoke going up into the sky." BBC News reporter James Cooke said the fire appeared to have broken out in a row of shops. 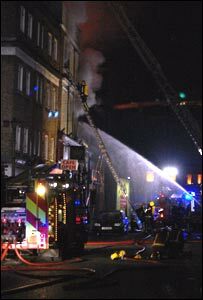 Revellers from local pubs and bars were moved away from the danger area, where flames were leaping up to 30ft in the air. Conservative mayoral candidate Boris Johnson said: "This will come as a terrible blow to their livelihoods and the area generally. My thoughts are with the traders, local residents and the emergency services who are, as usual, performing brilliantly under pressure." London Ambulance Service said it has ambulances and a hazardous response team at the scene. Seth Owuadey, 48, who lives in Kentish Town, was in a bar opposite the Hawley Arms and saw the first flames as they grew stronger. "A fire engine arrived but it took about 40 minutes for more to come, even though by then the flames were the height of a house. "We thought it started in the Hawley Arms, but it started in an alleyway behind there." Moira Smith, 46, also of Kentish Town, saw the flames out of the window of her home "and the next minute, it was on the news". Sitting on a bar stool in the middle of the road at the edge of the cordon in Chalk Farm Road, she said: "You could tell it was serious. The smoke was black. "I'm just shocked by it all. Please God, there'll be no casualties." The markets area is a major tourist attraction attracting up to 300,000 visitors each weekend to its six open-air and indoor markets and vibrant mix of bars, clubs, shops and restaurants.